Description: This uncommon nudibranch has a translucent white body with extensive white surface pigment. The pigment forms a triangle on the head, with diamond shaped patches down the centre of the back. The upper surfaces of the cerata are usually covered with white pigment, but may be translucent showing the white, brown or orange digestive gland. The rhinophores are distinctive, being brown in the basal portion, with a swelling near the tip, and a white tip. Habitat: Favorinus species feed on the spawn of other nudibranchs and are likely to be encountered wherever nudibranchs are abundant. The animals can be well camouflaged on large dorid egg masses. 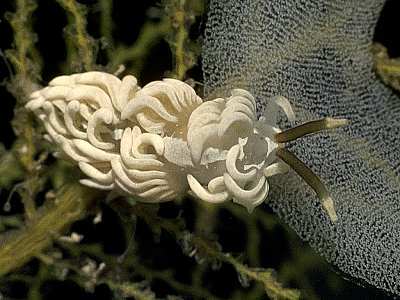 Juveniles feed on hydroids such as Obelia. The spawn of this species is a thin thread wound like a hair spring. Distribution: Widely distributed in the British Isles but rather local and scattered. This species is also known from the Mediterranean Sea to Norway. Rhinophores with brown shafts, a subterminal swelling and white tips. White pigment around the heart and along the midline of the back. Picton, B.E. & Morrow, C.C. (2016). Favorinus branchialis (Rathke, 1806). [In] Encyclopedia of Marine Life of Britain and Ireland.